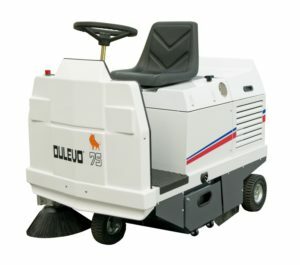 If you have a problem of dust, Dulevo 75 industrial sweeper is more than a solution. It's an extraordinary opportunity This compact rider industrial sweeper is the only machine that can cope with heavy sweeping conditions in narrow areas Heavy duty rider industrial sweeper designed to work in very dusty environment. Able to pick up from fine dust to large gravel is the ideal sweeper for heavy industrial applications. Is also ideal to be used also in every public or logistic areas such as warehouses, loading docks, parking etc.